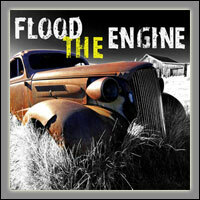 Thank you for visiting the Flood The Engine on line store. Before you start shopping, please select the country where you want your order shipped. This will activate the rest of the store and allow you to begin selecting the items you want to buy. After you finish adding items to your shopping cart, click the View Cart button to begin the check out process. If purchased separately these items come to $45. Order the package deal and save over $15.00. 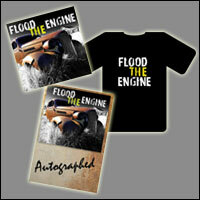 Be sure to select your t-shirt size (available in sizes Large or XL). You must select at least one single to activate this item. 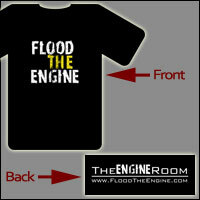 High quality Flood The Engine T-shirt. Be sure to select your size (available in sizes Large and XL). 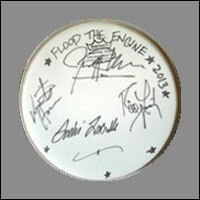 Drum head signed by all four members of the band. 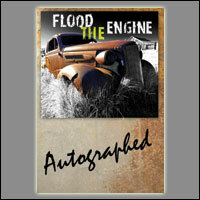 Poster signed by all four members of the band.